Everybody needs a friend, especially accessories. 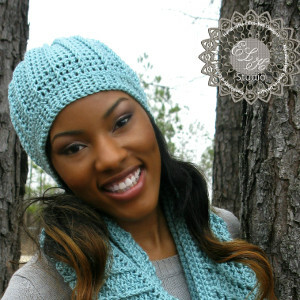 Don't just wear a scarf by itself, but rather use this free crochet hat pattern and make an Effortless Crochet Beanie. This simple hat will complete your outfit, and your favorite scarf will be glad you made her a buddy. Choose any color you desire and put this free beanie pattern to the test. Good things come in pairs, and sometimes the only thing you need to complete your outfit is a cute matching hat. Your wardrobe will surely welcome the addition! At the end of round 22- height should be 7.5 inches, does that include the band?? Instead of gathering 72 stitches to form top, I decreased 72 stitches 4 times. 1st row every 3rd and 4th stitch (54 remain), 2nd row 1st and 2nd stiches (36 remain), 3rd row every 2 stitches (18 remain), 4th row every 2 stitches (9 remain). Close small hole with tail and needle. This produces a cleaner closure with less bulk. Thank you for the scarf pattern. Now I can make the set! Hi there, The scarf pattern is on our site - simply search for the Stunning Crochet Infinity Scarf. Thanks! Where can I get the pattern for the scarf, the set is beautiful I would love to make the set. Hi there, We have contacted the designer with your question and will link to the project if we can add it to the site. Hi there, This is actually the Stunning Crochet Infinity Scarf. The pattern is on our site - all you have to do is search for it. Thanks! Does anyone know where I can get the pattern for the scarf that is pictured with this hat?